Transparency is of great importance to the Aston Homes team and that’s why we’re happy to share the ins and outs of our building process with you. Today’s topic? Brick infills! Enjoy as our team detail what they are, why they’re important and how our choice in materials lifts Aston Homes above the competition. Window infills close the gap between the top of the external window & door frames and where the roof starts on your home. Builders can elect to infill these gaps with brick or a cheaper option fibre cement. It is far more than just about the design element of your home’s facade – it is one area that builders commonly use to cut costs! What is the Aston Homes approach to window infills? 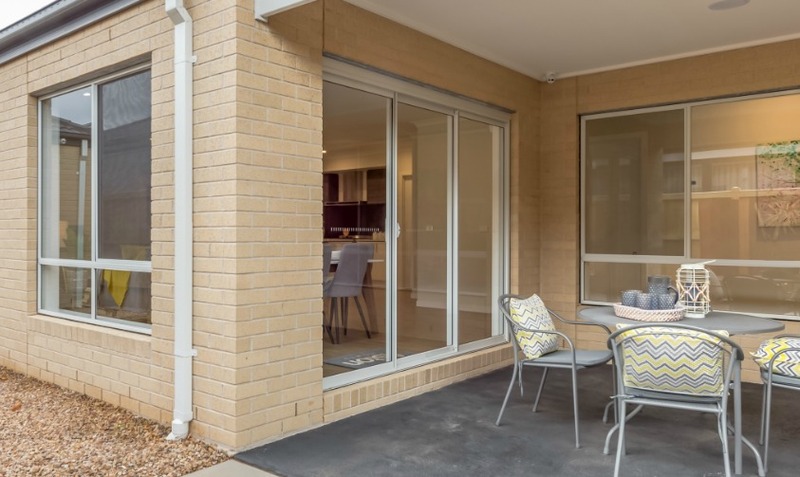 Aside from a couple of facades in the range – which due to the height of the windows don’t require brick work above – Aston Homes chooses to use brick infills above all exterior door and window frames as a standard. Garages can also be done for an additional fee). Homes with Brickwork infills are structurally superior to fibre cement infills for a couple of reasons. Firstly it is aesthetically better due to the consistency across all sides of the home. Secondly, it provides greater thermal efficiency than fibre cement alternatives, reducing energy consumption for years to come. Thirdly, there is zero maintenance for brick infills, whereas fibre cement, like external timber work needs regular painting to maintain appearance. Another quality measure implemented by Aston Homes is that the steel lintels erected above the windows and doors to support the brick work are galvanized, therefore requiring no painting or maintenance long term. Many builders will put in non-coated steel lintels to cut costs, however the owner then needs to regularly paint them to avoid them rusting. How does this lift Aston Homes above the competition? The benefits of brick infills outweigh the additional cost, that’s why its standard with all of the homes Aston Homes builds. A quality detail that is appreciated by clients who strive for the best possible workmanship for their happily-ever-after home. Courtesy of our many years in the building industry, the Aston Homes team have observed many buyers disappointed when they later learned about some premium finishes they didn’t know about or understand when they first signed up to buy their home. Many builders will charge additional fees for brick infills, instead of fibre cement, others wont even offer this option. At Aston Homes, brick infills are included as standard with a focus on building quality, contemporary homes with all the trimmings.